The zombie functions as a monstrous other, transgressing boundary and unsettling the modern identity, as monsters have always done. But, it goes beyond the scope of traditional monsters in that it also holds a mirror up to the secular self, and suggests to us that without the transcendent, we may be nothing more than animated corpses, or worse. The zombie film further deprives us of the security of civilization, exposing human beings as Hobbesian brutes. The cumulative effect of these functions brings us to a crisis of identity and meaning. In the pre-modern past, the self was a part of a cosmos seen as a “totality of existence because it [contained] the sense of ordered whole” (A Secular Age 60), and in this order held meaning for all things. In modern society, with the loss of the transcendent, any external referent by which we might understand the self has been removed and the modern self’s construction became an entirely interior process—reality is solely in the mind–“in the sense that things only have the meaning they do in that they awaken a certain response in us” (A Secular Age 31). With this move from cosmic meaning to meaning residing only in the mind, the modern identity, then, can be understood largely by what it is not—by the things of which it has been emptied. It no longer has a place in a cosmic hierarchy of meaning, nor does it interact with spiritual forces or charged objects in an enchanted world. The zombie, too, is defined by what is absent. Much has been lost in the turn away from the transcendent into ourselves. The zombie brings us face to face with who we are in the context of this loss. The zombie is the embodiment of this emptiness, for one of the key characteristics of the zombie is that it is “a body which has been hollowed out, emptied of selfhood” (Warner 357). It is essentially a “description of human existential diminishment” (367) that has been diminished one step further than has the ordinary resident of modernity. The zombie evokes despair and dread because it presents Modern, secular selves with the potential of being absent from oneself. This is part of the horror of the zombie, especially in the early twentieth century; it terrorizes the rationalist understanding of selfhood by exposing the fragility of subjectivity. The destruction of subjectivity is still a significant part of the horror of the zombie, but the events of the mid-twentieth century changed the conception of the self and therefore the monster that threatened it. After the horrors of the Holocaust and the use of the atomic bomb, faith in reason and the authority of science was abandoned, as had been faith in God in previous generations. This left humanity without any external authority. Sartre’s understanding of the self as existential agent is representative of the post-WWII identity. Because “it is impossible for man to transcend human subjectivity,” the new authority was the self. He believed that unlike the objective world, the existence of the self precedes its essence; “subjectivity must be the starting point.” Thus, we are completely free to choose our own purpose, our own meaning. Additionally, ideals or beliefs are not reality; action is the only reality, for the only way to determine the value of ideals or beliefs is to perform an act which confirms or defines it” (Sartre in “Existentialism is a Humanism”). Putting these ideas together, we can claim that, in the post-nuclear world we understand the self as existential agent. Kevin Boon suggests that human action “in the absence of any external locus of truth—that is, in the absence of a reliable ‘other’ in whom/which faith can be placed—must face the threat of engulfment by the world.” For the existential agent, the greatest fear, then, is that “it will be absorbed by the other and thus be irretrievably lost” (Boon [in Better off Dead] 55-56). The Modern secular self faces engulfment by the hostile immanent universe. Many of the deaths presented in zombie films are of a single screaming protagonist being pulled by countless cadaverous hands into the mass of the undead horde. This visually symbolizes the engulfment of the existential agent by the indifferent universe. Romero’s zombies are the embodiment of the challenge to the modern identity. 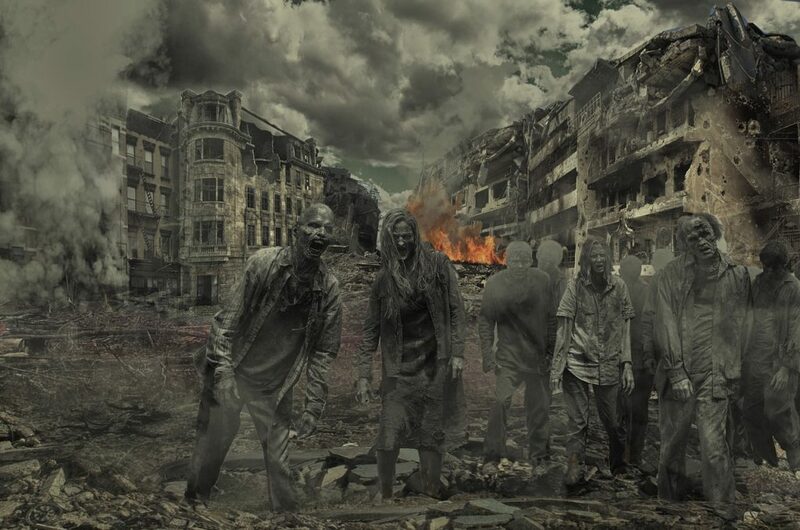 When one becomes a zombie, one of many within the horde, the subjective self is annihilated and the existential agent is engulfed by a malicious world.